The pro-democracy group founded by billionaire George Soros is leaving Hungary after its Prime Minister announced crackdowns on non-governmental organisations. Hungarian-American Soros’s Open Society Foundations (OSF) said it is moving to Germany, leaving what it called ‘an increasingly repressive political and legal environment’ in Hungary. The right-wing government of Viktor Orban announced the new restrictions yesterday, under a law dubbed the ‘Stop Soros’ bill. 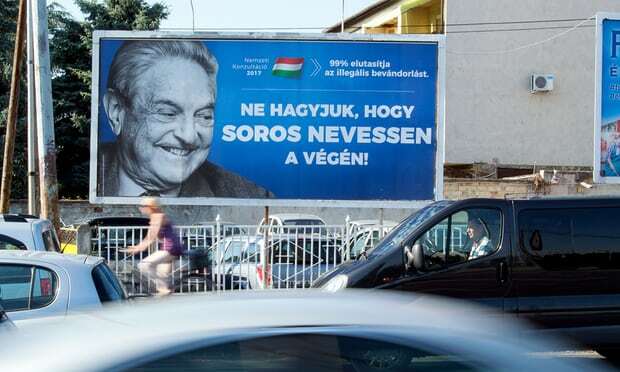 Prime Minister Orban, who won a landslide election victory last month, has repeatedly accused Soros and his organisation of encouraging migrants and undermining the national culture. The OSF said it would continue to support human rights work in Hungary as well as projects linked to arts, media freedom, transparency, education and healthcare, but it would move its Budapest-based international operations and staff to Berlin. ‘The government of Hungary has denigrated and misrepresented our work and repressed civil society for the sake of political gain, using tactics unprecedented in the history of the European Union,’ OSF president Patrick Gaspard said in a statement. Opposition and rights groups have long said that a departure of the OSF would mark a milestone in a slide towards authoritarian rule in Hungary and go against the principles of the EU – a charge dismissed by the government. Orban has increased his control over the media and put allies in control of formerly independent institutions, while his stance on refusing to accept large numbers of migrants in Hungary has also put him in conflict with the EU. Open Society said the campaign had ‘invoked anti-Semitic imagery from World War II’. The government has repeatedly denied this. It would allow the interior minister to ban any NGOs active in the immigration field deemed to pose a ‘national security risk’. It would also impose a 25-percent tax on foreign donations to NGOs that back migration.